In Dreaming the Future, Kenny Ausubel leads us into that possible new world and introduces us to the thinkers and doers who are-sometimes quietly, sometimes not-leading what he calls "a revolution from the heart of nature and the human heart." In a collection of short, witty, poignant, even humorous essays, Ausubel tracks the big ideas, emerging trends, and game-changing developments of our time. He guides us through our watershed moment, showing how it's possible to emerge from a world where corporations are citizens, the gap between rich and poor is cavernous, and biodiversity and the climate are under assault and create a world where we take our cues from nature and focus on justice, equity, diversity, democracy, and peace. Even those steeped in the realities of a world gone wrong and efforts to right it will find refreshing, even surprising, perspectives in Dreaming the Future. 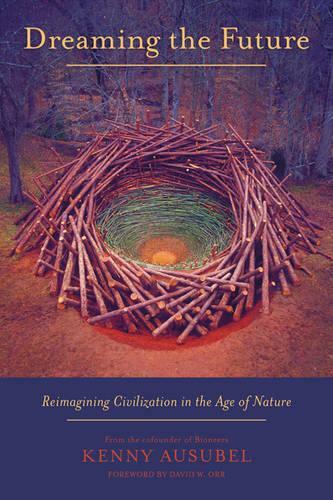 It will come as no surprise to readers that Ausubel is cofounder of Bioneers-which foreword author David W. Orr describes as "one part global salon...one part catalytic organization." The essays in this collection reflect his thoughts and proposals on a wide variety of topics related to this general goal, ranging from the Gaia theory of Earth as a self-regulating system, to the ecological effects of medical technology, the similarity of modern politics and organized crime, and the difficulty of organizing grassroots resistance against corporate exploitation. Many of these pieces have been published previously over the last decade on websites like The Huffington Post and Alternet.org. They are, however, still highly relevant, and the book is a convenient, readable, and informative corpus of Ausubel's work. His breezy, fast-paced writing style and his in-depth knowledge of environmental and political issues will inspire readers who share his values and his belief in the importance of shaping human behavior for the sake of environmental sustainability. A list of bibliographic sources for each essay provides guidance for readers who wish to do further research, but there are no footnotes for specific factual statements, which may limit the book's ability to persuade skeptical readers.